Sensitive Sam visits the Dentist is the second in the Sensitive Sam series. These are great multi-level books which are suitable for reading by young children, parents and professionals. The book starts off with a fairly straightforward story about Sam visiting the dentist. It touches on several of his anxieties but eventually he ends up enjoying his visit. This first section is aimed at very young children and contains easy to understand words and activities. In fact, young children are encouraged to participate in the story by tracing the line that the car travels to the dentist and choosing the flavour of the toothpaste. It's all very engaging. Along the way, there are numbered hints to parents. These hints refer you to pages in the back of the book, after the story. They say things like "Show, tell and do. What does a dental hygienist do? Page 23). Following the story, there are a series of tips for parents, numbered 1-15. As you would expect, the tip on page 23 has a paragraph about dental hygienists. The last section of the book has quotes, stories and tips on dentist visits from bloggers from all around the world. There are some very good tips there and many that I'll be putting in place with my own kids. All in all, it's a great book and is highly recommended. Sensitive Sam visits the Dentist is a short book jam packed with tips for parents and professionals. If nothing else, every single dental surgery should have a copy. If your child has problems with the dentist, then this is the book to get. 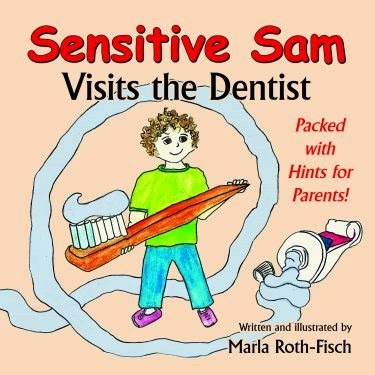 Sensitive Sam visits the Dentist - written and illustrated by Marla Roth-Fisch is available from Future Horizons publishing and from Amazon. Honesty Clause: I received a copy of this book free of charge for review purposes. wonderful share, great article, I liked the how to brush teeth link the most. I really feel that brushing properly is important.